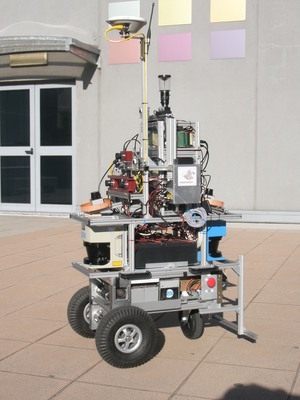 Robocom is the robot platform used for Rawseeds’ data-gathering activities. It is a differential drive platform, fitted with three PCBricks used both for robot control and for data acquisition. Robocom is suitable for indoor and (light) outdoor activity. It is an autonomous robot (though for Rawseeds it has been used in teleoperated mode), jointly developed by POLIMI and UNIMIB. The image above shows it fitted with (most of) Rawseeds’ sensors. capability for outdoor operation, in addition to indoor (this is useful for “mixed” environments). By clicking here you can download the user manual of Robocom, complete with a comprehensive technical description of the platform. What is Rawseeds? Who is it for? How can I contribute? Why does Rawseeds push towards the adoption of benchmarking procedures in robotics? Why did you choose those sensors and not others? Why do you provide the ground truth along with Rawseeds' datasets? Theme is Rawtigo 1.0 by Federico Maggi, based on Vertigo 2.0 by Brian Gardner.